Scatterplots are especially important for data science because they can show data patterns that aren’t obvious when viewed in other ways. You can see data groupings with relative ease and help the viewer understand when data belongs to a particular group. You can also show overlaps between groups and even demonstrate when certain data is outside the expected range. Showing these various kinds of relationships in the data is an advanced technique that you need to know in order to make the best use of MatPlotLib. This example uses an array for the colors. However, the first group is blue, followed by green for the second group. Any outliers appear in red. 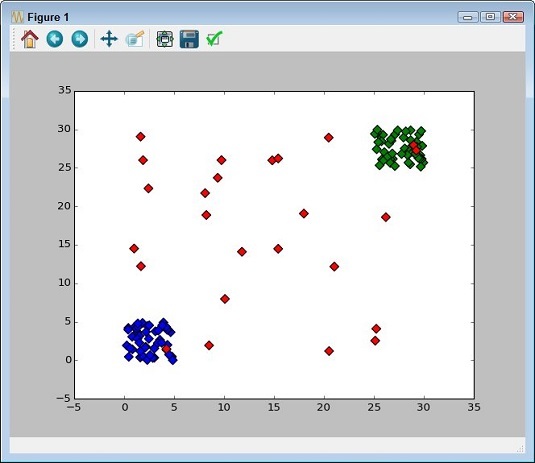 Color arrays can make the scatterplot groups stand out better. In some cases, you need to know the general direction that your data is taking when looking at a scatterplot. Even if you create a clear depiction of the groups, the actual direction that the data is taking as a whole may not be clear. In this case, you add a trend line to the output. Here’s an example of adding a trend line to a scatterplot that includes groups. Adding a trend line means calling the NumPy polyfit() function with the data, which returns a vector of coefficients, p, that minimizes the least squares error. Least square regression is a method for finding a line that summarizes the relationship between two variables, x and y in this case, at least within the domain of the explanatory variable x. The third polyfit() parameter expresses the degree of the polynomial fit. The vector output of polyfit() is used as input to poly1d(), which calculates the actual y-axis data points. The call to plot() creates the trend line on the scatterplot. 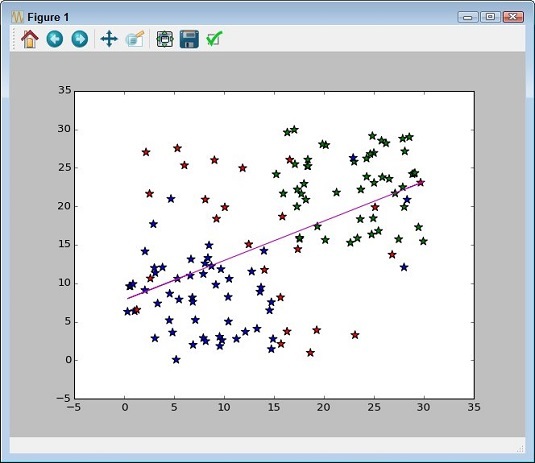 Scatterplot trend lines can show you the general data direction.